Intellectual property (IP) management is an area of corporate management that has often been neglected or overlooked by small and medium size enterprises, and even more so by smaller third sector enterprises, despite the fact that effective IP management strategies can make the difference between the success and failure of an organization. This book focuses on ways in which small and medium size enterprises - including social enterprises - can protect and manage their IP. 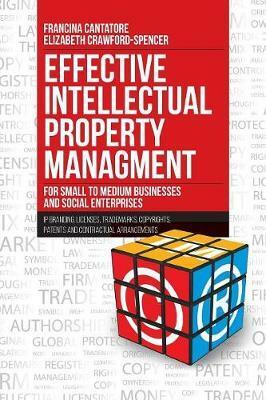 A valuable resource for any legal practitioner dealing with IP law and commercial law areas, this book explains the importance and value of IP, including patents, trademarks, copyright, branding and licenses, and provides insight into day-to-day challenges faced by smaller businesses and social enterprises. It also includes useful discussions on vital aspects of IP, such as using IP as security, IP branding, franchising models and contractual arrangements. Drawing on qualitative research conducted in Australia and identifying the unique challenges faced by third sector SMEs, the book offers practical strategies for effective IP management and protection. Its functional and up-to-date approach on IP related issues for small and medium size businesses and not-for-profits distinguishes this work from others in the field of IP rights management. This book assists ...managers and boards ... to come to grips with their intellectual property, IP branding, copyright and patents. As an IP practitioner, I found this book to be a very useful tool, particularly for SMEs who may not understand the importance of IP and how IP can be used commercially. ... written in an accessible easy-to-understand style which will appeal to a wide audience... a scholarly treatment of the subject, with the authors providing ample authorities and references as well as the results of qualitative research.